Last December research conducted by ContractorCalculator identified the MPs for whom it will prove most costly to lose the self-employed vote, and published the top 20 from each party. The results were based on data from the Office for National Statistics (ONS) and contractor sentiment indicated by a previous ContractorCalculator survey. 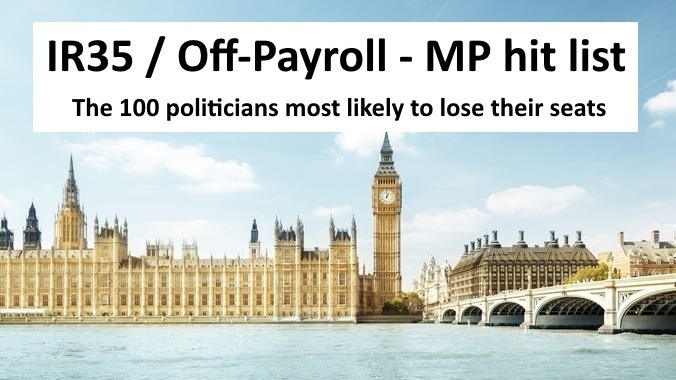 The full results of this research are now published, with the top 100 MPs, ordered by risk of losing their seat, due to the Off-payroll (IR35) reforms that Treasury, HMRC and the Chancellor are attempting to push through Parliament. In total, 85 MPs hold a majority in Parliament that would feasibly be overturned if the expected turnout of IR35-opposing self-employed voters from their constituency were to vote against them, and we list the next 15, making 100 in total, that are potentially under threat if the self-employed voter turnout is higher than expected. The research leveraged the data and compared the MPs majority at the last election with the likely number of self-employed voters in their area who would turn out and vote against them. Who are the potential IR35 political casualties? Of the vulnerable MPs, there are 43 Conservative, 33 Labour, and 7 Liberal Democrat politicians. Given the fine margins, the self-employed vote will prove crucial to either party’s fortunes at the next General Election. “The Conservatives appear to have a lot more to lose than Labour,” comments Chaplin. “They now face an uphill task if they want to save their seats." To support the campaign against IR35 changes, please subscribe to our mailing list, and help raise awareness by following the instructions set out on our IR35 campaign page. Please follow or connect with our CEO Dave Chaplin on LinkedIn. Dave regularly posts about the IR35 reforms and is an essential contact to have for keeping abreast of the latest news surrounding the legislation. Meetings with MPs are essential. We have prepared a 32 page fact pack to assist you with your meeting. Just email your MP name to us on info@contractorcalculator.co.uk and we will send you the information. Then you simply prepare, and meet your MP for 30 minutes.